A Norfolk primary school have held a tortoise and hare race. 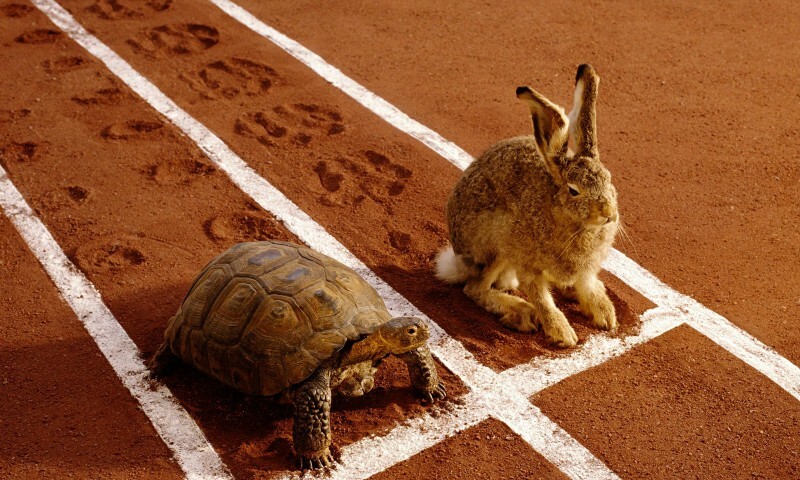 The race was setup to demonstrate the moral, slow and steady wins the race, from the story of The Tortoise and the Hare. Six selected children were involved in the race, three with hares and three with tortoises. The tortoise shells had been decorated and painted with a number. The hares had been made racing jumpers by members of the local knitting and gossiping club. The race was staged in the school field, using the 100m athletics track. All of the school attended, with parents and representatives of local tortoise and hare support groups. An emergency vet also was on hand incase of any injuries. The tortoises and hares were positioned under starters orders at the start of the track. Headteacher, Mrs Aesop, was chosen to start the race. She shouted, “Ready, steady” but instead of saying go, from her trouser waist, she whipped out a pistol and shot it into the sky. Due to the loud bang, one hare collapsed with a suspected heart attack, one hair bolted towards the school and ran full speed into a wall, later passing away due to a bleed on the brain and one is undergoing cognitive behavioural therapy (CBT) due to a hypersensitivity and anxiety to loud sounds. The tortoises were left at the start during all of the commotion and have been allowed to continue the race. Possibly due to the recent cold weather, the leading tortoise has only moved 10.1cm. It has remained there for the past couple of days with the other two in the exact same position. Either down to hibernation or being frozen to the ground, we will have to wait until they thaw or awake in the summer for the result. I’m not sure if this has taught-us (tortoise, get it!?) the moral of the story.